Today I would like to explain the difference between tolerance and acceptance. You can tolerate something without accepting it. However, you cannot accept something without tolerating it. I have always been a very assertive person and that’s why it is often difficult for me to understand why people accept certain behaviours that damage their own self-image and self-worth. This could be true in their personal and in their professional life. 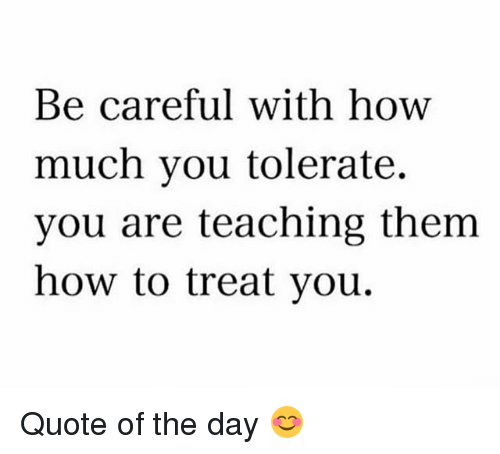 If you tolerate certain behaviours for too long, you will become a very bitter and disgruntled person. Do you want to live life like this? Nobody goes to work to be yelled at, belittled and/or disrespected. I wouldn’t and you shouldn’t either. Believe me, if you are a good and hard working person, you will always find another job. With a good attitude you can learn any new skill and you will find a job in which you feel valued and appreciated while having fun along the way. How awesome is that? The challenge is that in many organizations the values and behaviours are hanging on the wall but they don’t walk down the hall. Here is the thing, you always have a choice. Always, always, always! Become fearless and stand up for yourself: Don’t get in conflict with an angry person (emotions high, intelligence low). After a few hours go to the person and say, “Can I speak to you? After our encounter this morning I would ask you if it is possible to stay respectful, even when things go wrong. I cannot tolerate this kind of behaviour towards me.” or “I did not appreciate how you spoke to me earlier today. How does yelling and screaming help us to solve the problem?” It may be difficult for the person to acknowledge but I promise that you will make him / her think and chances are this person will change his/her approach. You may think now, “I could never say this to my boss.” Yes, you can! Don’t be disrespectful but you have to learn to be assertive. You have to draw a line. Get clear on what you want: Write a list and be as detailed as you can be about your needs and wants in a job (what values are important for you, do you like your current industry or would you like to make the transition into another industry/job, would like to learn more, would you like to learn and to grow to become an apprentice/supervisor/ manager, are benefits important, should it be a full-time position or a part-time position, would you prefer contract work, how long should the commute be, corporation or family owned business, how should your manager be, how should your co-workers be, do you want freedom or structure, do you like flexible hours, is work-life balance important, how much vacation would you like to have, would you like to work from home, do you like overtime or do prefer steady hours, do you like to travel or do you prefer to be onsite, or do you want to start your own business). Be as specific as you can – clarity is power. If you know what you want, it is easier to attract what you want when you start taking action. Do you get my point? You don’t have to accept your current reality, start working on a new one. Don’t think about what can go wrong. Think about what can go right. Deal? If people treat you poorly, it has absolutely nothing to do with you. This is how they deal with their dissatisfaction in their own life. Stop whining and start taking action. I believe in you and your choices.